"William James if not Freud would certainly agree with me when I say that the agonies of the drunkard find their most accurate poetic analogue in the agonies of the mystic who has abused his powers."  Malcom Lowry, Letter to Jonathan Cape. Lowry's fascination with the literary possibilities of mysticism is easily seen in Under the Volcano. For example, the Consul's great work, a yet-unpublished (and unfinished) mélange of "sensational new data on Atlantis", "chapters on the alchemists", and "something about Coxcox and Noah", seems to be a conglomeration of mysticism, myth and similarities between biblical and Central American, after Ignatius Donnelly, author of Atlantis: The Antediluvian World. the elongated neck and head and open beak of the sacred ibis. – UTV, 34. The African Sacred Ibis (Threskiornis aethiopicus) breeds in sub-Saharan Africa, and formerly in Egypt, where it was considered a symbol of the god Thoth. 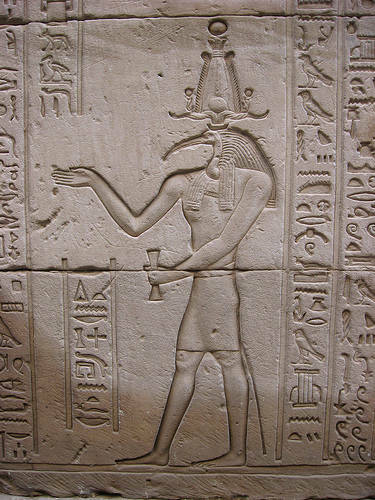 Thoth was associated in the later history of ancient Egypt with the practice of magical arts, writing and the judgment of the dead.